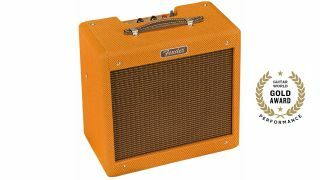 The Fender Pro Junior is an amp that lives up to its name. It may be small, low-powered and inexpensive with only two control knobs, but Warren Haynes, Derek Trucks, Eric Clapton and Jeff Beck have sung its praises. Beck has even used Pro Junior amps for 95 percent of his live shows, including at Madison Square Garden! Fender has made a few changes to the model since its introduction in 1993, but the new Pro Junior IV LTD boasts the most dramatic upgrades Fender's ever made to it. Most notable is the Jensen P10R Alnico speaker (the same modification Beck made to his amps) replacing the former Eminence 10-inch, but the volume and overdrive circuits are upgraded too, and lacquered tweed covering replaces the previous model’s black Tolex. These features truly earn the Pro Junior IV its pro title. FEATURES The Pro Junior IV features a 15-watt tube circuit driven by a pair of EL-84 power tubes and two 12AX7 preamp tubes with a solid-state rectifier. Fender ships the Pro Junior IV with Groove Tubes, so you don’t need to budget for a tube upgrade. Circuit geeks will also notice that Fender has upgraded the capacitors and a few other key components. The modified circuit delivers tighter bass response and also makes the transition from clean to overdrive more gradual as the volume level is increased. Controls consist of volume and tone (both go to 12). The cabinet is ¾-inch particle board, which makes the amp seem heavy for its size (at least when compared to small vintage tweed amps). In addition to the lacquered covering, other tweed-era hardware touches abound, including the oxblood speaker cloth, leather handle, red power jewel and chrome front panel. The 10-inch Jensen P10R speaker plugs into a ¼-inch speaker jack that allows use of an external 8-ohm speaker cabinet instead. PERFORMANCE Simply said, the Pro Junior IV is a tone beast. Even with the volume control at 2, its clean tones are harmonically rich and robust. Overdrive emerges between 5 and 6 with vintage humbuckers and between 7 and 9 with single-coil pickups. At 12 the distortion delivers an aggressive midrange roar that’s almost British in character, but the bass is appropriately tamed so even drop-D power chords don’t cause the speaker to fart out. The Pro Junior IV is inspiring to play, with luscious, responsive tones that cover the gamut of rock, blues and country flavors.